Category Archives for "Work culture and Change"
Bill Ringle and Chris Clearfield discuss the remarkable simplicity that can avert catastrophic business disasters, applicable of organizations of all sizes. Complexity is unavoidable, so here is how to think about it in order to manage it successfully. Why it is important to consider how many things have to go RIGHT for your project to succeed. The importance of developing a test and feedback cadence in your work. The myth of the open door policy. 2:41 Chris tells about the time when a physics professor took the time to explain a difficult subject to him, and eventually took him under his wing, and the impact that had on his young mind. 4:46 Chris describes his role working for James Street, and using computers to recognize how much things were worth. 9:00 How reading about aviation infrastructure, or lack thereof, in Asia allowed Chris to see the complexity inherent in the system. 11:00 The genesis of starting his own firm. 15:18 The importance of preparing for the “knock-on” consequences. 27:16 How Chris tracks his deep work hours. 33:18 How doctors in Toronto figured out that asking patients a handful of questions could quickly determine whether or not the patient needed an x-ray. 37:25 Chris’s three big takeaways. Before starting System Logic, Chris worked as a derivatives trader at a prestigious proprietary trading firm focused on understanding and hedging risk. After years as a trader in New York, Tokyo, and Hong Kong, his role matured from trading to analyzing the financial and regulatory risks inherent in the business of technologically complex high-speed trading to devising policies that mitigate those risks. He co-authoredMeltdown: Why Our Systems Fail and What We Can Do About It with András Tilcsik, a Toronto business-school professor, to tell us how and why. He graduated from Harvard College, where he studied physics and biology and is a licensed commercial pilot. He now lives and works in Seattle, WA with his family. For more information, visit the Rethink Risk website. Eric Herrenkohl talks with Bill Ringle about how to hire A-Players for Small Business Leaders. 3:04 Eric discusses what it was like meeting Bob Perkins at YoungLife. 6:08 Why “A Players” can sometimes be difficult. 9:25 Why leaders should always have a Plan B when it comes to dealing with toxic A Players. 14:25 What it means to have an A Player scorecard, and what the process means for team buy-in of new recruits. 14:51 How asking questions can create a whole new level of employee engagement. 18:03 Tested tips and tricks for putting interviewees at ease before and during an interview. 23:57 What inspired Eric to write the book How to Hire A-Players. 27:35 What Eric does to stay productive and on track. Eric Herrenkohl is the President of Herrenkohl Consulting, a consulting and retained executive search firm that he founded in 2002. He works as an advisor to CEOs on building superior leadership teams. Eric is the author of the upcoming book Crowbar: Pry away top talent, surround yourself with the right leaders, and create the team your customers demand. His previous book How to Hire A-Players is an Amazon bestseller published by Wiley that is described as one of the top 10 recruiting books of all time by Recruiter.com. Business Week, Fox News, NBC News, the Toronto Globe and Mail, the Philadelphia Business Journal, the Philadelphia Inquirer, Inc.com, Careerbuilder.com, MSNBC.com, Monster.com, and the LinkedIn Talent Blog have all featured his work. Eric holds a master’s degree from Covenant Seminary in St. Louis and an undergraduate degree in economics and history from the University of Michigan, Ann Arbor. He and his wife and four children live in the Philadelphia area. For more information, visit Eric Herrenkohl’s website. David Livermore talks with Bill Ringle about how awareness of values diversity drives business value. The importance of taking inventory of your company culture. The role of diversity metrics in business. The key ingredient of shared objectives. David Livermore is a thought leader in cultural intelligence (CQ) and global leadership and the author of ten books on cultural intelligence and global leadership. His book, Leading with Cultural Intelligence, was named a best-seller in business by The Washington Post. He’s president and partner at the Cultural Intelligence Center in East Lansing, Michigan and a visiting research fellow at Nanyang Technological University in Singapore. Prior to leading the Cultural Intelligence Center, Dave spent 20 years in leadership positions with a variety of non-profit organizations around the world and taught in universities. He’s a frequent speaker and adviser to leaders in Fortune 500’s, non-profits, and governments and has worked in more than 100 countries across the Americas, Africa, Asia, Australia, and Europe. Dave has authored several other books, including the award-winning titles, Serving With Eyes Wide Open and Cultural Intelligence: Improving your CQ to Engage our Multicultural World (Baker Publ.). Dave loves to take research and make it accessible to practitioners. He has been interviewed and referenced by major news sources such as Atlantic Monthly, CBS News, The Christian Post, Christian Science Monitor, The Economist, Forbes, NBC, The New York Times, USA Today, The Wall Street Journal and The Washington Post. For more information, visit David’s website. Dr. Janice Presser talks with Bill Ringle about Teamability®, and reveals some essential tips and tricks for team success on My Quest for the Best. 3:00 Teaming up with Dr. Jack Gerber. 8:20 [One of the most important question to ask about people] – “How do they really make meaningful contributions to something bigger than themselves? 9:18 Two more important points to think about when evaluating the people on your team and their level of contribution. 10:50 Presser uses herself as an example to describe teaming characteristics. 16:43 The characteristics which don’t factor into Teamability. 21:46 How teaming characteristics affect personal interactions. 22:33 How Presser’s clients use her expertise on Teamability. 24:54 The 4 components used for the Teamability Playbook. 31:00 How to appreciate the people on your team in the role that they play. 34:13 How growing up in your family structure creates the foundation for your views of teaming. Dr. Janice Presser is CEO of The Gabriel Institute, a behavioral scientist, and architect of the technology that powers Teamability®. She has studied team interaction in academic, clinical, and business settings for over 40 years, and has applied her expertise in the areas of HR metrics and measurements, workforce planning, and the future or work. Dr. Presser has authored seven books, most recently, Timing Isn’t Everything. Teaming Is (July 2017). In an era of digital disruption and transformational change, Dr. Presser’s integrated technology and management methods create collaborative culture, generate extraordinary business results, and open new paths to meaningful work and organizational health. For more information, visit Janice’s website and blog. Founder and CEO, Anita Campbell Associates Ltd.
Anita Campbell talks to Bill Ringle about the nuggets of advice that small business owners need to succeed in the midst of their busy schedule. How she made the successful transition from the corporate world to being a successful entrepreneur. What other entrepreneurs want from learning materials and networking. Four trends that are driven by different forces and are shaping what tools and strategies entrepreneurs use to grow. 1:38 Campbell’s journey from corporate attorney to business decision-maker and consultant to founder of Small Business Trends. 5:47 The different types of content, personalities, and media Campbell hosts on her podcast. 8:22 How tracking private email shares can indicate the success of published content. 12:50 Campbell’s technique for quick idea formulation. 16:00 The story of BIzSugar.com and what it does for small business owners. 20:45 On how Small Business Trends is able to track changes and trends in the market, especially with emerging technology. Anita Campbell is a small business expert who serves as CEO of Anita Campbell Associates Ltd, a woman-owned consulting firm helping companies and organizations reach the small business market. Prior to starting her own businesses in 2001, Anita held a variety of senior executive positions in the corporate world, including Senior Vice President of Bell & Howell Publishing Services, culminating in the role of CEO of an information technology subsidiary of Bell & Howell. As Publisher of several online media properties and syndicated content, Anita reaches over 1 million small business owners and entrepreneurs annually. She is the founder and Editor-in-Chief of Small Business Trends, an award-winning online publication, and hosts Small Business Trends Radio, where she interviews other small business experts. Anita is a prolific writer and a regular speaker at small business, marketing and technology events. Her new book, Visual Marketing, was published in September, 2011. In addition to her own publications, her articles and columns have been published at places such as Inc Technology, OPEN Forum, and Success Magazine. Her expertise is often sought by the media, and she is quoted in The New York Times, Fortune, USA Today, and many other outlets. For more information, visit Anita’s website. Randy Pennington talks with Bill Ringle about how to make company culture work to increase productivity and morale. The importance of company culture in attracting talent. The risks of not changing fast enough as a team or company. The 6 choices that need to be made regarding how a culture develops. The single most significant trait of a company culture. How structure and process are the building blocks of habits. The executive team that rolled out training to emphasize its importance to the company. Randy Pennington helps leaders achieve positive results in a world of accelerating change an disruption. He is a twenty-five year business performance veteran, award-winning author, and consultant who has worked with many of this country’s best-known organizations including: Alabama Power Company, Motorola, LSG Sky Chefs, SmithBucklin, Hyatt Hotels and Resorts, Texas A&M University, Marathon Oil, Sprint, Huntsman Chemical, State Farm Insurance, and DFW Airport in addition to government agencies at the local, state, and national level. Additionally, he serves as an adjunct instructor in the Cox Business Leadership Center at Southern Methodist University. Pennington is the author of three books: Results Rule!, which received the 2007 Best Books Award from USA Book News, and On My Honor, I Will, which Ross Perot described as having “cracked the code of great leadership.” His third book, Make Change Work, received the 2013 Best Books Award for general business from USA Book News. Randy’s background is a unique blend of line, staff, and consulting experiences ranging from hourly employee to senior management. He holds a Bachelors and Masters Degree in Psychology and completed Postgraduate work in Organization Administration and Management. He is a past Chairman of the Board for the American Heart Association, Texas Affiliate, and a founding member of the Texas Council on Cardiovascular Disease and Stroke. Randy has been inducted into the Speakers Hall of Fame by the National Speakers Association and is past Chairman for the NSA Foundation. For more information, visit Randy’s website. Andrea Waltz and Richard Fenton talk with Bill Ringle about using the power of no to create the results you want in business and in life. 1:22 Waltz tells about her first real job working for LensCrafters: how she met Fenton and launched into her own business at a young age. 3:29 Fenton – Tells about meeting Fenton and meshing on what it meant to be a high performer and achiever. 5:44 Waltz – On getting their first client JC Penney. 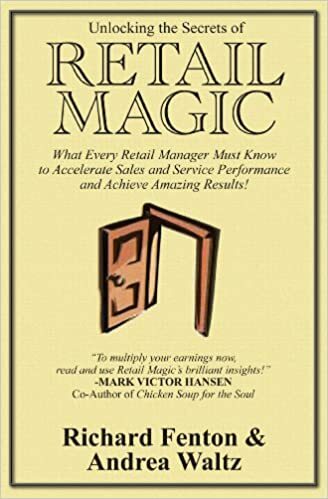 7:58 Waltz talks about hers and Fenton’s self-published book The Secrets of Retail Magic and how their “Go For No” concept allowed them to become an essential resource to JCP. 9:03 Waltz tells how Fenton’s boldness got them their first client. 13:55 Fenton describes how changing their positioning to keynoters gave them a better footing with decision makers at an organization. 22:00 Waltz and Fenton discuss what they do to overcome the emotional rollercoaster. Andrea Waltz and Richard Fenton are the co-founders of Courage Crafters, Inc., through which they teach people how to reprogram the way they think about the word NO, and to fail their way to success. They have brought their message to many organizations over the last 15 years, including American Express, Kodak, Pep Boys, Harry & David, and more. Richard’s background includes working in Distribution Sales for Disney and as Training Director for Hart, Schaffner & Marx and LensCrafters. Andrea originally wanted to work with George Lucas, but after getting rejected (she was 8 years old) she went on to build a career in sales and management at LensCrafters, where was was the youngest General Manager in company history. Together Richard and Andrea have written four books, the most popular of which is Go for No!, which has been on #1 on Amazon’s ‘Sales & Selling’ Best Seller list and has remained in the top 20 for the last two years. Their articles have been published in Success Magazine and hundreds of online and offline journals. They are members of the National Speakers Association and the Direct Selling Association U.K.
For more information, visit Andrea and Richard’s website. 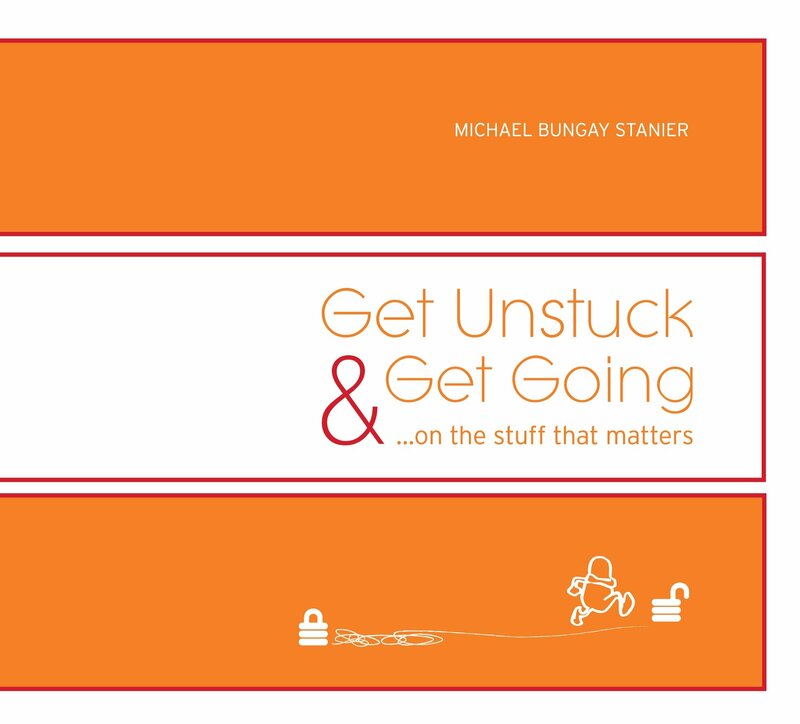 Michael Bungay Stanier, author of The Coaching Habit, talks with Bill Ringle about how to strengthen your management effectiveness by giving less advice. 1:23 Stanier describes how his high school peers’ teenage angst inspired him to begin coaching. 4:37 Stanier discusses Daniel Goleman’s HBR article about Emotional Intelligence: Leadership Against Results. 6:53 Stanier discusses the key distinction between teaching someone and helping them learn. 8:11 Stanier’s tools for leaders in helping their employees get to the next level. 12:05 How asking your people the right questions can help them change their behavior. 13:08 Stanier discusses his company Box of Crayons and its role in managerial training. 14:32: How a Canadian company upped their bench strength for better problem solving. 15:42: The best coaching question in the world. little less rush to action just slow down the action a little bit so that when you move you move more effectively and more efficiently. 20:08 Best of the available information concerning habit building. 20:36 The three parts of Stanier’s new habit forming formula. 23:31 The difficulty of forming new habits to replace old ones. 26:53 The characteristics of organizations who are ready to adopt behavioral change. 28:15 Stanier discusses the process of writing the book, and how hiring an editing “coach” helped him create the best version of it. 33:53 The research process for the books – testing with real people. 37:54 Why explicit requests are far better than implied requests. 41:00 The importance of being clear of what you want in your own mind before asking for it. Michael founded Box of Crayons, a company that helps organizations all over the world do less Good Work and more Great Work. The Box of Crayons company is well known for their coaching programs that help time-crunched managers coach in 10 minutes or less. Michael left Australia 22 years ago to be a Rhodes Scholar at Oxford University, where he fell in love with a Canadian and explains why he now lives in Toronto. He is the author of Do More Great Work, which has sold over 100,000 copies, and several other books, including his most recent, The Coaching Habit: Say Less, Ask More & Change the Way You Lead Forever. Michael Tchong talks with Bill Ringle about Ubertrends and how they are shaping our business opportunities and personal lives. Michael Tchong is an innovation specialist, change agent, entrepreneur, and speaker. He is the founder of five startups, including MacWEEK and ICONOCAST, and has pioneered ventures in desktop publishing, personal information management, internet analytics, and online marketing. His latest startup is Social Revolution®, which aims to reinvent America by crowdsourcing innovative solutions. As a speaker, Michael uses his knowledge of marketing, media, and technology to help audiences better grasp how massive waves, which he calls “Ubertrends,” are reshaping society, as well as the opportunities and innovations these Ubertrends propel. His ability to identify emerging trends was refined at such prestigious ad agencies as DDB and Chiat/Day. He is the author of Social Engagement Marketing, an easy-to-navigate guide to the world of social media. In this interview, Dave Logan talks to Bill Ringle on My Quest for the Best about the role of management in business. What to do if something unexpected comes along. 0:59 Dave discusses how he became interested in business, and talks about the role that management plays in business. 7:55 Dave talks about an addiction to the status quo, and that often businesses don’t want to rock the boat when they really should be changing with the times. 9:03 Even when it’s uncomfortable, often the best thing for businesses leaders is to get out of the way of others who can do their job better. 10:14 Business leaders must follow their gut and intuition when answering important questions. 11:05 People act as if their answer to the Oracle Question is the right answer, but depending on their answer, this can negatively impact the business. 11:41 Dave lists the ways in which this sense of superiority can cause a lack of forward movement and growth. 12:51 Dave gives an example of a business with which he has worked that was not aware of this questioning process, which led to an undesirable default future. 19:34 Dave tells us that there are four things that a business needs to get right, and that there is at least one of the four that need attention: Strategy, Structure, Systems and Processes, and Culture. 20:23 There is an instrument on Dave’s website that can help a business leader find which of the four needs to be reviewed. 21:26 Most of what analysts have written about Culture is dead wrong, and Dave’s book Tribal Leadership discusses how to get it right. 22:14 DaveLogan.com contains a free download for the audiobook of Tribal Leadership, a free instrument called Fix Your Company, and other instruments that can rate a business’ culture. 22:50 The objective of these free instruments on his website is to help a business leader see what is really going on in one’s company. 23:12 Dave was surprised to learn that very few employees would devote themselves to the company’s values, regardless of the bottom line. 25:20 One of the most widespread problems in management is that many of the management techniques are out of date. Dave Logan studies how people communicate within a company — and how to harness our natural gifts to make change within organizations. He looks at emerging patterns of corporate leadership, organizational transformation, generational differences in the workplace, and team building for high-potential managers and executives. He’s the co-founder and senior partner at CultureSync, a management consulting firm, and works with Fortune 500 companies, governments, and nonprofits. Much of CultureSync’s work is derived from a ten-year study of over 24,000 people published at Tribal Leadership (2008), which shows how organizational culture evolves over time and how leaders can nudge it forward. Neil Smith, CEO of Promontory Growth and Innovation, has for the last 20 years focused on helping large corporations dramatically improve performance and profitability by growing revenues and innovatively reducing costs. Neil has led initiatives across a number of industries with some of the strongest companies in the United States, including Mellon Bank, Willis, and North American Van Lines. He recently spearheaded the highly-visible initiative across Bank of America and a firm he co-founded was responsible for projects at Heinz, Detroit Edison, and Blue Cross Blue Shield of Tennessee. His efforts have helped increase profits at top companies by 20 percent or more. Neil is the co-author of the book How Excellent Companies Avoid Dumb Things, which illustrates eight key barriers that are holding back even the world’s best organizations and twelve principles that are important in any process for change. Neil has an MBA from the Harvard Business School where he was a Knox Fellow and a B.A. in Physics and Economics from the University of Keele in England, where he graduated with Honours. He is a member of the International Advisory Board of British American Business, the President of the North American Foundation for Keele University and head of the university’s alumni association in North America. For more information, visit Neil’s website. 1:35 How an interest in jazz music sparked Linkner’s early passion for creativity. 3:25 Why improvisation is such a valuable skill in the marketplace. 5:41 Examples of companies who are fostering creativity well. 7:15 The story of ePrize and how they used creativity to stay ahead of competitors, even the ones they invented themselves. 10:27 Why the way leaders interact with their teams affect productivity or, in some cases, keep employees from unlocking their creative potential. 11:50 How 3M fosters continually fosters innovation. 13:20 The difference between incremental and disruptive change. 14:25 The story of Detroit and its innovative early years, complacent middle years, and its rebirth of innovation in current years. 17:55 What if the Founding Fathers had not taken bold action? 18:30 The prevalent myths of creativity. 19:50 Why it’s important to spend time doing things you enjoy away from work. 20:15 The art of role-storming, rather than brainstorming. Josh Linkner is the New York Times bestselling author of Disciplined Dreaming: A Proven System to Drive Breakthrough Creativity, named one of the top 10 business books of 2011. He is also the CEO and Managing Partner of Detroit Venture Partners where, together with business partners Earvin “Magic” Johnson and NBA team owner Dan Gilbert, Josh is actively rebuilding urban areas through technology and entrepreneurship. Josh is the Founder, Chairman, and former CEO of ePrize, the largest interactive promotion agency in the world providing digital marketing services for 74 of the top 100 brands, and has founded three other successful technology companies. He is also Adjunct Professor of Applied Creativity at the University of Michigan. He has been honored as the Ernst & Young Entrepreneur of the Year and the Detroit News Michiganian of the Year, and is a President Barack Obama Champion of Change award recipient. Josh is a regular columnist for Fast Company and Inc. Magazine, and his work has been featured in The Wall Street Journal, Forbes, USA Today, and The New York Times. Josh is also a Berklee-trained professional jazz guitarist who performs regularly in jazz clubs throughout the United States. Most importantly, Josh is on a mission to make the world more creative. For more information, visit Josh’s website. Lisa Bodell talks to Bill Ringle on My Quest for the Best about creativity, positive thinking, and spring cleaning. The reality behind how innovation occurs in business. What makes leadership harder than it has to be for some. The importance of mindset in approaching solutions. How you can unlock creative energy in your company by killing stupid rules. 1:37 Lisa’s days in advertising showed her that she was creative in a strategic way, leading her to create innovative businesses. 4:40 A big misunderstanding in business and innovation is that only artists are creative, and Lisa wants to make sure people understand that every person at every level can be creative and innovative. 8:20 Lisa observes that one of the biggest obstacles to fostering creativity is skepticism, and that business leaders need to break down their propensity to immediately be skeptical of new ideas. 12:10 Lisa estimates that 80% of companies around the world are committing a grave mistake: having a complacent culture, where employees are resigned to the status quo and to not make waves. 13:25 There is a diagnostic in Lisa’s book “Kill the Company” where an employee can see how complacent they are, and she outlines three things one must do to no longer be complacent: diagnose oneself, figure out which behaviors one wants to change, and then figure out what small things one can empower others to do to contribute to an overall cultural change. 15:00 Lisa is careful to point out that these changes should be implemented from the middle out. In other words, it is not effective to have upper leadership telling people what to do, instead empowerment should come from the people at the center. 16:01 Lisa implements something she calls ‘Little-Bigs’ in which a company can see the biggest overall change by doing little, every day changes. She gives two examples that have been effective for her clients. 17:30 One of the most effective exercises Lisa has used with executives is having them imagine they were trying to kill their own company as a competitor would, which helped them identify the things which were weak or not working, enabling them to root out the bad to make room for more prosperity. Lisa Bodell is the founder and CEO of futurethink, an internationally recognized innovation research and training firm that helps businesses embrace change and become world-class innovators. She founded futurethink on the premise that everyone has the power to innovate — they just need to know how. Clients such as 3M, GE, and Johnson & Johnson look to futurethink to develop new styles of thinking and generate innovative ideas. Lisa is globally recognized as a leader and pioneer in the field of futuring and innovation — creating a unique, straightforward approach to an otherwise complicated topic. She created the widely adopted SIPC Innovation Framework (STRATEGY, IDEAS, PROCESS, CLIMATE), which has helped innovators around the world easily embrace innovation, providing a clear method that breaks innovation down into manageable parts. In addition to running futurethink and lecturing, Lisa currently serves as an advisor on the boards of the Institute of Direct Marketing in London, The Women’s Congress, the Association of Professional Futurists, and the prestigious Institute for Triple Helix Innovation think tank, the only innovation initiative of its kind within the U.S. government. She also serves as a finalist judge at the annual Idea Crossing Innovation Challenge and FIT’s innovation challenge (which futurethink co-created), has taught courses on marketing and creativity at American University, and serves as a faculty member of the American Management Association. She is the author of Kill the Company: End the Status Quo, Start an Innovation Revolution and an author of Success Simplified, a collection of works featuring other chapters by Dr. Stephen Covey, Dr. Tony Alessandra, and Patricia Fripp. Lisa has appeared on FOX News, and in publications such as Crain’s, Business Week, The New York Times, WIRED, Investor’s Business Daily, Successful Meetings, Harvard Business Review, and The Futurist. Beverly Beuermann-King’s passion is to help individuals and teams find the right strategies to effectively deal with today’s stressful challenges. As one of the leading stress management speakers in the Canada, and a Certified Speaking Professional, Beverly has spent the last 15 years training and educating more than 40,000 leaders, teams, front-line workers and volunteers using her S-O-S Principle™. Beverly’s background in Psychology, Sociology, Management, and Adult Education helps her bring a realistic, accessible and practical approach to employing practical solutions for making life more satisfying. As a sought after expert, Beverly has made many television and radio media appearances on shows such as Breakfast Television and CFRB and is often used as a resource in major publications. A trusted Education Consultant to the Canadian Mental Health Association, Beverly has created a series of booklets called Stress Sense™ and developed workshops for Understanding Mental Illness and Suicide Awareness for their Making Mental Health Matter™ series, which is used across Canada. She has also authored many published stress and wellness articles, writes a corporate wellness e-newsletter, and is a contributing author to the book Awakening The Workplace. For more information, visit Beverly’s website. How major career changes can arise naturally out of aspects of earlier jobs. How insights from your personal life can help grow your business. Quick tips on racking up Frequent Foreplay Miles. Shela Dean is a Relationship Coach and speaker. She has counseled more than 2,000 couples since 1983 and is the author of Frequent Foreplay Miles, Your Ticket to Total Intimacy! – a guide to improving intimacy for couples. Shela began studying the dynamics of personal relationships during her two-decade career as an estate and family attorney before retiring from law to begin relationship coaching in 2004. Her unique blend of humor, insight, and practical advice helps couples find a better way to navigate the friendly, and sometimes not-so-friendly, skies of life – and have a good time doing it! For more information, visit Shela’s website. Terry Hawkins is an award-winning speaker, enterprise educator, and founder of People In Progress, which recently expanded from Australia to the United States. A masterful educator in attitude and mind-set change, cutting-edge sales techniques, leadership development, communication strategies, and more, Terry is Australia’s most-booked female speaker. She is also the winner of the 2012 RADICAL Entrepreneur Award and of Australia’s prestigious Educator Award for Excellence. Terry is the author of the bestselling book There Are Only Two Times in Life, NOW and TOO LATE! and a series of childrens’ books, as well as a contributing author to several more volumes, including The Power of More Than One and 20/20: A Fresh Look at Business Growth. For more information, visit Terry’s website. How to adjust to the change from working in a corporate environment to launching a business. The new world of work and what skills both companies and business owners will need to hone to succeed. Three techniques that Ginny has used to differentiate her business in a crowded industry. Ginny Clarke is an expert in talent and career management, diversity recruitment and executive coaching. She is the founder and CEO of Talent Optimization Partners, LLC, a talent management consulting firm offering fully integrated talent management solutions for corporations, fast-growing companies and government entities. She is widely respected as a thought leader and practitioner of recruitment and retention strategies. She offers provocative remedies for organizations seeking to optimally leverage their global workforce. Prior to forming her own firm in 2009, Ginny was a partner at Spencer Stuart, the global executive search firm, where she successfully recruited professionals in a variety of senior-level executive and board positions, as well as co-founded and led Spencer Stuart’s Diversity Practice. Ginny is the author of Career Mapping: Charting Your Course in the New World of Work, as well as a frequent speaker, presenter, and media guest. For more information, visit Ginny’s website. Tim Connor is the President and CEO of Connor Resource Group and Peak Performance Institute. He is a full-time professional speaker, trainer, coach, consultant and bestselling author. A Certified Speaking Professional, he has given over 4000 presentations since 1973 in twenty-one countries around the world. Each year over 85% of his presentations are return engagements for the same clients on such topics as peak performance management, effective leadership, customer focused sales strategies, personal motivation, value driven customer service and building positive business and personal relationships. Tim is the best selling author of over 70 books, including several international bestsellers, Soft Sell (now in 21 Languages), 81 Management Challenges, Your First Year in Sales, 91 Mistakes Smart Salespeople Make, SOLD, and Above Ground. For more information, visit Tim’s website. Smart steps to take when you find yourself in a situation where the rules and structures have changed (or vanished!). How stretching beyond the comfort zone led to great opportunities. Key points to consider as a founder transitions to a new role and brings in a CEO. How the best practices of your business life can bring order and harmony to your family life, as well. Mike Williams brings 22 years of diverse training, leadership, and organizational development to his role as CEO of the David Allen Company, a global leader in productivity training and consulting that provides services designed to increase performance, capacity, and aligned execution. The company counts among its clients some of the world’s most prestigious corporations, including over 40% of Fortune 100 companies. David Allen’s methodology Getting Things Done® (GTD) provides proven techniques for gaining greater control and perspective. 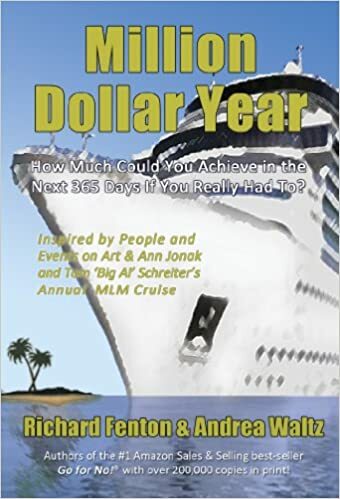 This pioneering and proven system has assisted millions of people worldwide and has well earned its recognition as the gold standard in personal management and productivity for many of the world’s best and brightest people and companies. Mike was a featured panelist at the 2009 inaugural Getting Things Done® conference in San Francisco. His strong enthusiasm for GTD has led him to develop a curriculum for teaching the methodology to children. Before becoming CEO of the David Allen Company, Mike was Senior Business Leader for GE Healthcare, where he was responsible for creating and executing the strategic plan and vision of his division. He earned the GE Healthcare Hero Award for leading the team responsible for orchestrating the extremely successful integration of two service organizations with distinct corporate cultures. His team utilized GTD planning and execution models to achieve integration and realignment in 60 days. The #1 complaint on the job for professionals and managers. What to do about an attitude you want to change. How western cultures and eastern cultures view attitude differently. Practical ways to assess and manage your attitude in order to achieve more happiness and success. 3:55 [On why attitude is overlooked] “I think it’s overlooked because it seems like common sense, people think they should already know that. Why go to a class and learn that? 5:17 Dr. Zimmerman describes the differences between what people in Eastern and Western Civilizations want out of life: success vs. happiness. 6:10 West meets East: The story of how Apple collaborated with Chinese manufacturing to come up with a better product. 8:26 Dr. Zimmerman describes how it’s possible to develop a better attitude. 10:41 Dr. Zimmerman tells a bit about his personal life journey, and why having a positive attitude is so important for him despite hard times. 14:50 The practical reasons for counting your blessings against your problems. 16:11 Two tried and tested tips for how to finish what you start. 18:06 Personal insights Dr. Zimmerman gained during the process of writing the book. Dr. Alan Zimmerman is a full-time professional speaker and trainer in the areas of motivation, leadership, communication, change, and work-life balance. He has given more than 2000 programs in the last 25 years to more than a million people in 48 states and 22 countries. A Certified Speaking Professional and a member of the National Speaker Association’s Speaker Hall of Fame, he maintains a 92% ratio of repeat and referral business. Alan is the Founder, Owner, and President of Zimmerman Communi-Care Network, a speaking, training, and consulting company with offices in the Minnesota, Florida, and the U.K. He is also a professional speaker and consultant for the State of Missouri and was twice named “Distinguished Faculty Member” by Institute for Managment Studies. He is the author of Pivot: How One Simple Turn in Attitude Can Lead to Success and The Service Payoff: How Customer Service Champions Outserve And Outlast The Competition, among other titles. For more information, visit Alan’s website. Stephen Denny is a competitive strategy and marketing consultant who thinks marketing is about big ideas as well as selling things. He helps brands in technology, consumer products, clean energy, and services define their competitive positioning, communication strategies and implementation plans in the market. He is also the author of Killing Giants: 10 Strategies to Topple the Goliath In Your Industry. Apart from writing and consulting, Denny is a frequent speaker at corporate events, industry conferences and graduate business schools on topics relating to competitive strategy and marketing. He holds multiple patents, has lived and worked in both the US and Japan, and has an MBA from the Wharton School. Prior to consulting, he was a 20+ year senior marketing executive having managed the people, strategy and budgets at brand name technology companies like at Sony, Onstar, Iomega and Plantronics. For more information, visit Stephen’s website. The benefits of hiring with adaptability in mind. As a therapist, corporate coach, and author, Dr. Steven Craig extends his expertise in clinical psychology and business consulting across a broad range of areas. He is the author of the book The Six Husbands All Wives Should Have: How Couples Who Change Together Stay Together and has appeared in the media numerous times, including ABC World News Tonight with Charles Gibson, the New York Times, Newsweek, and more. Steve is also the host of Therapy Thursday on 96.3 FM WDVD’s Blaine & Allyson Show, one of Detroit’s top-rated morning shows. Steve owns two businesses in addition to sitting on the advisory board of a $300 million dollar company. As an executive coach he’s coached “C” level and other high-ranking executives in a wide variety of industries including manufacturing, healthcare, advertising, energy, and more for over twenty years. As a clinical psychologist he runs a highly successful clinic in one of Detroit’s premier locations and has served at the state and national level for the field of psychology. Steve strives to help people recognize and build on their strengths rather than focusing on their weaknesses or belaboring their past. In this way, his clients are always building better futures and breaking free from continually repeating the same old unhealthy patterns that brought them in to see him in the first place. He also works in the area of sports and performance psychology and helps athletes, executives and other high performance individuals learn to heighten their skills and maintain peak performance. For more information, visit Steve’s website. Barry Moltz is a nationally recognized expert on entrepreneurship who has given hundreds of presentations to audiences ranging in size from 20 to 20,000. With decades of entrepreneurial experience in his own business ventures as well as consulting countless other entrepreneurs, Barry has discovered the simple, strategic formula to get stuck business owners out of their funk and marching forward. Barry has written four books, including BAM! Delivering Customer Service in a Self-Service World and You Need to Be A Little Crazy: The Truth about Starting and Growing Your Business, which describes the ups and downs and emotional trials of running a business and is in its fifth reprint. His most recent title, Small Town Rules: How Small Business and Big Brands can Profit in a Connected Economy, is coming out in April 2012. A member of the Chicago Area Entrepreneurship Hall of Fame, Barry has appeared on many TV and radio programs such as The Big Idea with Donny Deutsch, MSNBC’s Your Business and NPR’s The Tavis Smiley Show. He hosts his own radio show, Business Insanity Talk Radio, and writes regularly for the American Express Open Forum, Forbes.com and Crain’s Chicago Enterprise City. For more information, visit Barry’s website. How behavioral skills lead to success. The necessity of stepping outside our comfort zone. Why having fun at work is not only more enjoyable, but vital to gaining new insights and developing new forms of collaboration and teamwork. Karen Hough is the Founder & CEO of ImprovEdge, a company founded on the understanding that the skills of improvisation – the ability to think on your feet, arrive at solutions through the side door, and communicate in ways that bring people together – are the keys to innovation and business success. Karen trained with Chicago’s legendary Second City improv comedy group and had a career in stage, film and TV before working for many years as a senior sales executive in the network engineering industry. She originated and expanded the sales and management efforts of three separate technology start-ups, launched partner programs, and assisted in East Coast and National expansions. By combining all her skills, she has been using improvisation as an engaging learning tool to help businesses succeed for over 12 years. She is the creator of the Yes! Deck, a handy deck of cards packed with exercises, tips and ideas, and the author of the Amazon #1 category Bestseller, The Improvisation Edge: Secrets to Building Trust and Radical Collaboration at Work, which has also been named to the Top 25 Business Books for 2011 by 800CEORead. She is a national conference keynote speaker on topics such as executive presence and presentation skills, negotiation, and leadership, and is the recipient of the Athena PowerLink Award for outstanding women-owned businesses. For more information, visit Karen’s website. Charles Lee is the Founder and CEO of Ideation, an idea agency that specializes in helping organizations and businesses take their ideas and make them remarkable via creative strategy, branding, design, marketing, web, social media, and custom events. He is also the author of Good Idea. Now What?, a book that guides people in implementing ideas well. Charles is deeply committed to making our world a better place through collaborative social enterprise; to that end, he is the creator of grassroots efforts including JustOne, Ideation Conference, and the Freeze Project, as well as the co-founder of JustOne. He regularly speaks around the country on topics such as creative process, idea-making, innovation, branding, new media, and compassionate justice. For more information, visit Charles’ website. How following your passion opens doors to new opportunities. What Congress can learn about working productively with people with whom you strongly disagree on issues. A three-step process for helping people and organizations change. The risks of social media technology for young people today. As a motivational speaker, communication skills trainer, and founder of The Art of Change, LLC, Dr. Rick Kirschner seeks to help his audience find the personal motivation and learn the needed skills to do the important work today for creating a better tomorrow. He offers The Art of Change Skills For Life™ speeches, training and coaching programs to businesses and other organizations to teach positive change, influence and persuasion, teamwork ansd leadership, and healthy living. Before turning to speaking and coaching full time, Rick was a practitioner of Naturopathic Medicine who specialized in the treatment of stress related illness and the mind/body connection. Since starting the second phase of his career, Rick has authored or co-author several books, including the new How To Click With People: The Secret To Better Relationships In Business And In Life and the international best-seller Dealing With People You Can’t Stand: How To Bring Out The Best In People At Their Worst. He has also created numerous award-winning CDs and audio products. His clients include everyone from Heineken to NASA to Progressive Insurance to Texas Instruments. He’s been interviewed on hundreds of radio and television programs, including CNBC, FOX and CBC and his ideas are found in newspapers and magazines including USA Today, London Times, The Wall Street Journal, and Executive Excellence.